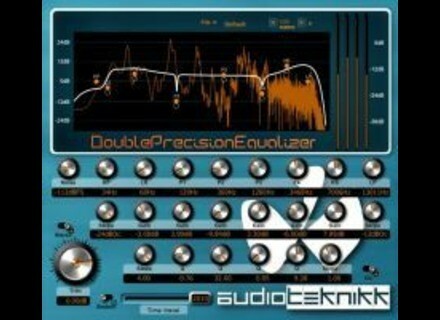 DoublePrecisionEqualizer, Software parametric EQ from AudioTeknikk. 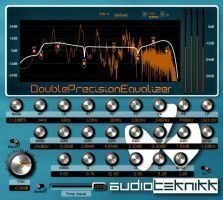 AudioTeknikk has updated DoublePrecisionEqualizer to version 0.53 Beta. High CPU consumption caused by GUI is now halved. Added controllable nodes to graph. RMS and PPM now correct. Added "Time travel" slider to change character of the sound. Q and Slope values are now correct. Added variable slope on LP & HP. Added preset manager for the user to make his own presets. Noise and pops some times when sweeping frequencies are now gone. Added broken modus to get some crazy sound. Aradaz Updates Aradaz Maximizer 5 Aradaz has updated the Windows and Mac OS X version of Aradaz Maximizer 5 to version 1.6.5.
g200kg KeroVee Updated g200kg has updated KeroVee to version 1.26.